Now that the blitzkrieg assault on Obamacare is over, the battle to repeal and replace the Affordable Care Act hasn’t gone totally up in smoke. It just has fallen, for now, into lots of still critical bits and pieces. The public now knows how vital, widespread, and entrenched this federal health care program has become. As the New York Times described it, Medicaid has “come of age.” And with the American Health Care Act, aka Trumpcare, in flames for now—especially with its proposed radical revamp of Medicaid— governors and legislators in 18 states that had declined under the ACA to expand the program’s coverage may be rethinking why their constituents are getting poorer care. Medicaid may be a significant reason why the GOP will flounder in further efforts to repeal and replace the ACA. Virginia Gov. Terry McAuliffe has promised to try once again to push a Medicaid expansion, and he may be joined by North Carolina’s Roy Cooper. As leaders in Utah and Georgia tiptoe toward broadening Medicaid coverage in their states, Maine voters this fall will consider a ballot issue to do so. Lawmakers in Kansas approved a Medicaid expansion but saw it immediately rejected by the governor. Proponents then tried but failed by three votes to override the gubernatorial veto. After his defeat, Trump talked about letting Obamacare die on its own, especially by attacking it through bureaucratic actions, notably by HHS Secretary Price. Much attention has focused on whether the administration could crash the health insurance markets critical to the ACA, for example, by halting the federal defense of its key cost subsidies. GOP House members have sued to contest the Obama administration’s green-lighting of those payments, which they consider undue meddling by Uncle Sam in free markets. Trump and Price, theoretically, could let them vanish. But what happens then to the millions insured under Obamacare? 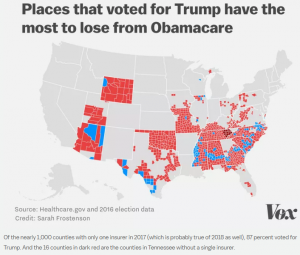 Republicans now have no replacement, and the political consequences could be significant if they let the ACA wither and offer voters no help. GOP lawmakers late last week turned themselves inside out, declaring that they would support subsidies, especially for the poor, perhaps into 2018. Insurers already are jittery about continuing to participate in Obamacare, with Anthem the latest major company to hint it may bow out. Patient-consumers in swaths of the country now see dwindling options among insurers offering them health coverage. The administration could offer encouragement, including with regulatory adjustments and even more financial support to improve this. But that would make Obamacare healthier. Still, Trump especially may need to be mindful that it’s his voters that will be most harmed by shaky insurance markets and a repeal of Obamacare. (Thanks to Vox for the excellent visual depiction above of this). Americans will learn a lot about what role insurers will play in Obamacare’s fate because they must submit soon to regulators their 2018 plans and rates. Price, meantime, can make regulatory changes that could affect Obamacare a lot. The administration already has signaled that it will take a lax view on enforcement, through the IRS, of the individual mandate. This is the requirement that all Americans carry health insurance or face fines. It’s important because it broadens the pool to include healthier, younger Americans, and to better share the risks, costs, and benefits of health insurance. Price also could loosen regulations so states could redefine “essential benefits,” the list of medical services that must be covered by health insurers. These include covering everything from emergency care to hospitalization to prescription drug payments to women’s reproductive health. The HHS secretary also can undercut other aspects of Obamacare, such as its efforts to improve delivery of services and to lower costs. A key cost-reduction move in the ACA was to push providers to so-called “bundled” payment plans. Under this plan, hospitals, for example, would become the central point in setting prices and receiving payments for certain treatments like knee, hip, and some heart procedures. Rather than each provider billing patients separately, all would get together, set one price, and through the hospital they would get a bundled payment that then would be divided up. Price has expressed his opposition to this approach, which can reduce doctors’ fees. He’s signaled he will delay bundled payment tests run under Medicare and Medicaid. The GOP remains deeply divided in its own ranks about a path forward on health care. The president has taken to attacking House conservatives for helping to bring down the planned ACA repeal and replacement, and they, in turn, are making new, difficult demands on what they want in Trumpcare. So-called “moderates” in the party, meantime, are stuck, too. They know they can’t face their voters if the GOP throws tens of millions of Americans off health insurance and slashes Medicaid, with its boons for the middle-class, the old, young, disabled, and chronically ill.
Partisans also keep punching themselves in the face by harping not on how Trumpcare might improve Americans’ health but on how they hope to cut taxes. They can’t talk about how the AHCA increases access to health care, and they’re waging a tough fight to argue it makes it more affordable. But they are clear Trumpcare would offer hundreds of millions of dollars in tax cuts to the wealthy, Big Pharma, medical device makers, and tanning salon owners. As party leaders have tried to “pivot” to their planned revamp of taxes, they keep emphasizing that they will pay for even more cuts for corporations and the rich with “savings” and deficit reductions from health care. Some Republicans have claimed the party will renew its ACA attack in the next few weeks. But the administration and Congress at the same time will be dealing with a U.S. Supreme Court nominee, a budget, the debt ceiling, and, potentially, new initiatives with the tax code and infrastructure. Then, too, there’s the persistent Russia scandal. With no apparent consensus on Trumpcare, how will it be realistic to revist the ACA soon? In my practice, I see the great suffering and struggle inflicted on patients harmed while seeking medical services. I know how health care policy and medical costs can be daunting for most of us. The sweeping, swift GOP attack on the imperfect ACA, to their credit, galvanized American voters. But the war to ensure we all have affordable, accessible, safe, and outstanding health care is far from over. We need to keep on top of this life-changing concern.